These are the characteristics of the FIAT ABARTH 1300 SCORPIONE S model year 1969, version for Europe North America with 2-door coupe body type, RWD (rear-wheel drive) and manual 4-speed gearbox. Petrol (gasoline) engine of 1280 cm3 / 77.9 cui displacement with advertised power 55 kW / 74 hp / 75 PS / 6000 and 108 Nm / 80 lb-ft / 3000 of torque. Ooutside length is 3610 mm / 142.1 in and wheelbase 2045 mm / 80.5 in , standard wheels were fitted with tires size 155 SR 13. Official base curb weight 730 kg / 1609 lbs, gross weight GVWR 900 kg / 1984 lbs. In today's world of automobile collectors and investors, limited-production cars are often, perhaps too often, relegated to car parlors, dream garages, toy barns and museums, where they languish. 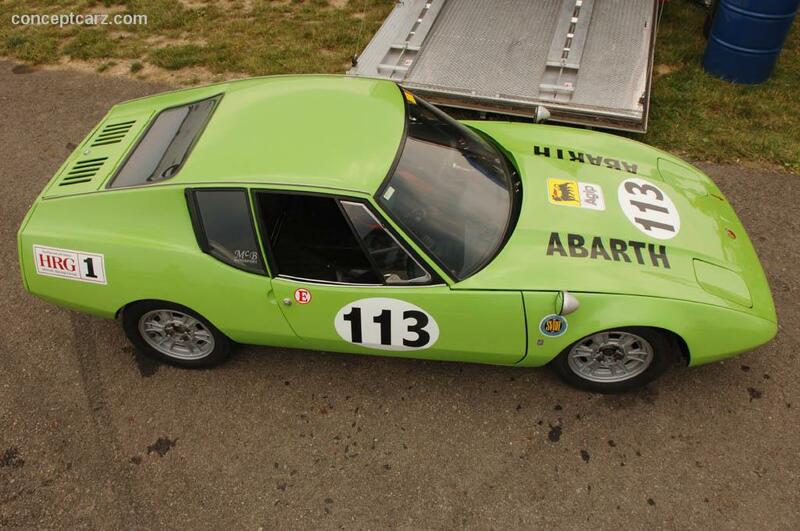 You won't find the 1969 Abarth Scorpione SS of Mark Maehling and Kirk Jones living such a pampered life. Their car, one of only five built, is exercised regularly on racetracks across the United States. The delicious coupe, one of only three that still exist, is the only one competing regularly in historic racing events, carrying on a heritage that began shortly after it was manufactured in Italy and made its way to Germany. This one was raced in Germany in the 70's and 80's and has competed in the Pittsburgh Vintage Grand Prix, the Monterey Historics and Watkins Glen. Finished second in the Historic Race Group for the country in 2005. While its light green color, reminiscent of an unripe apple, might cause some onlookers to frown, the incredible speed, nimble handling and raspy exhaust tones of this pint-sized car cause many other spectators to smile and look in amazement. Pittsburgh Vintage Grand Prix 2014 Winner! Inaugural Brickyard Vintage Racing Invitational 2014 Winner! On July 22, 2014 Mark contacted us & told us that he was informed by the Inaugural Brickyard Vintage Racing Invitational at Indianapolis Motor Speedway that he has also won 1st in Class in G Production and 9th overall in small bore class! He now also holds the lap record for Abarth at the Brickyard! As with most Abarth creations, the Scorpione SS was meant to kill giants. This car was campaigned extensively in Germany during the 1970s and '80s by its original owner before coming to the United States. Not long after, the owner decided to sell the car--but not to just anyone. The design is eye-catching and even exotic, with its Kamm tail, pop-up headlights, and a sloping hood. Powering the Scorpione SS is a Fiat 124 engine fitted with twin Weber carburetors. Horsepower is in the neighborhood of 100. There is a Fiat 850 gearbox, disc brakes and an independent coil-over suspension found in the front. When it went up for sale, six people expressed interest. Rather than base the sale on bids, the owner decided to interview each prospect before choosing one with whom he was most comfortable. A friend of Maehling's won the contest and acquired the car. Unfortunately, personal problems prevented the new owner from enjoying the car, and it eventually landed in the hands of Maehling and Jones, who have known each other since they were kids growing up in Pittsburgh. Today, the two of them work on the Abarth whenever they can and buy spare parts wherever they can find them. “We probably have one of the largest collections of spares in the world,” says Maehling. High-revving Scorpione SS models produced about 100 hp, cornered on a dime and had a penchant for overheating--not surprising, since the radiator is mounted in the front of the car and the engine is in the rear. A 7.5-foot-long cooling hose extending through the cockpit and a few other tricks in the Maehling-Jones car help to keep everything cool except the driver. Maehling, who does all of the driving, says that the inside of the car can reach 175 degrees. Wearing a three-piece Nomex suit, he says, he loses about 10 pounds a race. Most Abarths, this one included, race with their rear decks slightly open for cooling, which also helps with stability. Maehling insists that this practice inspired Porsche engineers to create the whale tail that has been used on generations of Porsches. The Scorpione is more distinctive than other cars of its era, with its Kamm tail, sloping hood and pop-up headlights, all of which help to make this car treno speciale. Post by Cortile Italian Car Show.